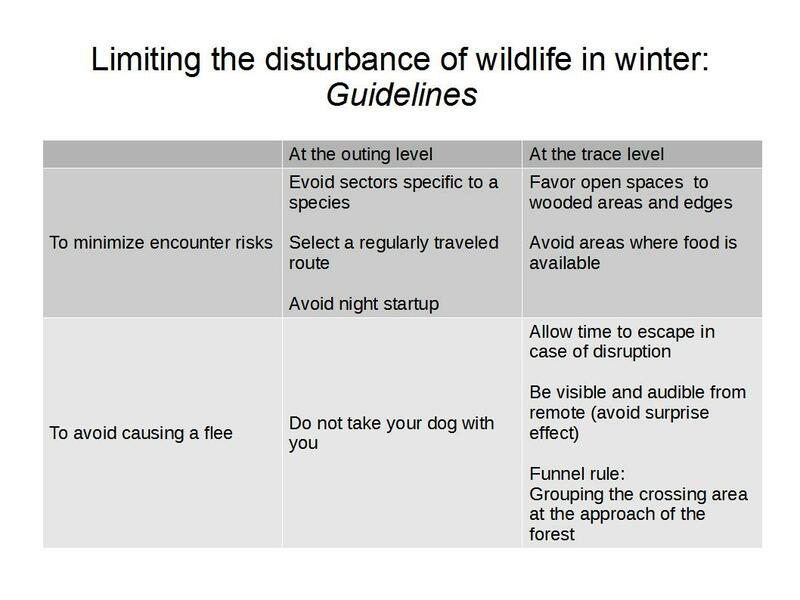 Winter is a difficult time for wild animals, and the increasing crowd in the mountain during this period can have a dramatic impact on wildlife. While the snow is making its appearance these days, here are some tips from Igor Frey, mountain guide, on how to decipher the risks of disruption and to reduce them in our winter activities. The last ten years have seen a significant evolution of mountain practices during winter. The first factor, and the most glaring is the growing number of people indulging in the pleasures of snowshoeing and skiing. Car parkings become full as soon as the first snowflakes hit the ground and “classic” routes are beset by endless cohorts going, spatulas to spatulas, up the mountain, and it’s better to get up early if one hopes to make his own trace… This phenomenon goes along with a second parameter: the full conquest of the natural medium. Overcrowding in certain areas; the growing attraction of the wilderness, tranquility and freedom push practitioners to look for pristine sites, new routes and unknown areas. This trend is not benign, it reduces more and more quiet zones for wildlife, and consequently it takes away precious shelters in winter. Another aspect is about timing: historically, mountain practices occurred during the spring season, mainly for security reasons (avalanches being more easily predictable), but today they happen throughout the full winter season. But this “temporal conquest” is not limited to the season, it also resonates throughout the day: night-outings at full moon or summits reached early morning before work or freeèrides at sunset after a hard day of work… The parade of head lamps can sometimes be very impressive! 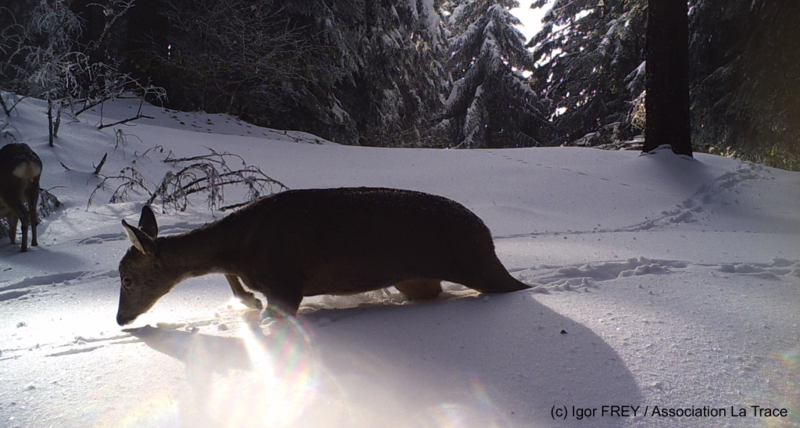 It is suspected that the recent rapid expansion of winter mountain practices has serious consequences for a wildlife trying to survive… Yes, but … things are not so simple! We do not have yet a good enough grasp of it to fully understand this phenomenum and cannot be too categorical, especially as we cannot accurately assess the impact of over-crowding on wild animals, disturbance or dependency? Is it a generic problem or is it species’ dependent or even specific to individuals within the same species? In short, it is impossible for the moment to define a comprehensive model with certainty. However, we know at least that a disturbance exists; so it would then be wise trying to minimize its effect with an objective to obtain a harmonious and respectful human/wildlife coexistence in the natural medium. The challenge raised by these issues concerns essentially the awareness of practitioners. How to convince everyone to adapt its practice with a minimum of prohibitions and constraints. Being conscious that surprising an animal during an outing is not just an opportunity for a “nice encounter,” but rather something to try to avoid. 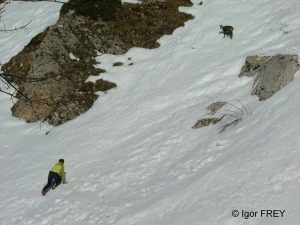 So simply add a parameter in the preparation of a tour: avalanches, good snow, vertical drop … and the risk for the wildlife! First, we must understand that this period is very difficult for the animals survival. There is a reason why so many of them choose to “sleep” (lethargy or hibernation) or migrate… For those who stay, who have chosen to face the harsh winter, conditions are difficult. Despite their very good morphological and behavioral adaptations, the winter’s fighters remain highly vulnerable during this period. The primary physiological needs are strained. These warm-blooded animals must maintain their body temperature despite the mercury just waiting to fall, the wind, the reduced sunlight, and an almost permanent contact with the snow. This fight against cold requires a large amount of energy that they draw on their fat reserves… as long as they have some! The second problem, which goes along with the previous one, is to find food, even though winter for wildlife is not a time of abundance… The leaves have fallen from the trees, the grass is covered with snow or ice, and the few still available to them (lichens, conifer needles, bark …) is hard to digest and does not provide a high calorie intake. Carnivores are in a better position though, despite the absence of small prey that usually make their feast (hibernation, migration, or hidden under snow), predation is much easier on large mammals which are more vulnerable at this time of year. To these physiological considerations must be added an increased sensitivity of animals for two biological periods of the year: reproduction and birth. Unfortunately, for some species, these may fall into a time when skis and snowshoes are already out or not yet withdrawn… This is the case of Chamois (in rut in November / December), the Ibex (rut in December / January) and Black Grouse (parade in April / May). It is therefore imperative to be vigilant in order to not disturb these species in these specific times. users of the medium, is simply not to add disturbances to these natural challenges and cause a flee that is not inconsequential. Indeed, disruption of an animal forces him to run out. Besides the risk of accident during the flee, simply moving, depending on the snow (quantity and consistency), may require a large expenditure of energy. 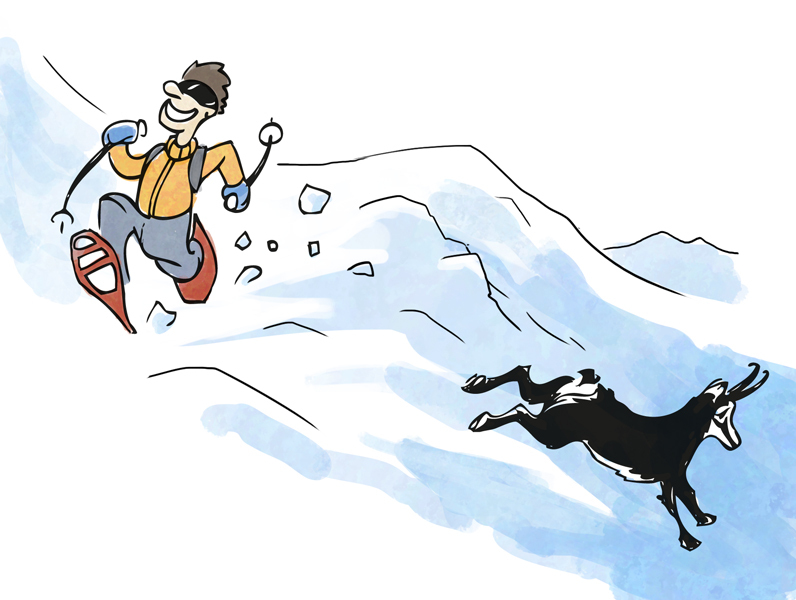 For a chamois, as an example, to flee in a snow slope with 50cm of powder takes 60 times more energy than a normal walk on flat ground (source G. F. Mattfeld, 1974). Moreover, for some animals, the winter strategy is to stay hidden for not being eaten and to not move so to spend a minimum of energy (such as for the Hare, the Black Grouse and the Ptarmigan). For them, a disturbance is particularly harmful: leaving their hiding place increases the risk of predation and requires them to recover or rebuild a shelter (which for the Black Grouse in particular, is not a trivial matter as he must rebuild an igloo …). Finally, for a winter animal choosing a specific sector is significant (less snow, easier travel, more accessible food …) and when he abandons his favorite area, it is not sure of finding another favorable area.